As a jazz pianist, her elegant style has often been compared to that of the legendary Marian McPartland. Tara’s vocal and instrumental renditions of classic jazz standards and contemporary original and popular songs are genuine, warm and uplifting. Tara has appeared as a solo artist and bandleader, as well as with a wide variety of ensembles, from small combos to large swing bands, at countless venues in the greater Chicago area, southern Wisconsin and throughout the Midwest. Her performance credits as a bandleader include engagements at the Palmer House, the Chicago Marriot, the Continental Plaza, the Ambassador East, the Drake Hotel, the Lincolnshire Marriot and the Hyatt Regency O’Hare, as well as established Chicago jazz venues such as Redford’s and the Jazz Bulls. 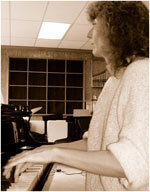 Ms. Singer performed as pianist and vocalist for the Chicago Grandstand Big Band from 1979-1981, with the Jazz Wave Big Band from 1994-1996 and was the resident solo pianist at Lake Lawn Resort in Delavan, Wisconsin from 1990-2005. She was a featured vocal soloist for the Chicago White Sox for three seasons and a headliner for the Chicago Tribune Concert Series. In addition to her commercial music experience, Ms. Singer has accompanied church choirs and performed for a wide variety of church sponsored events and services.